Ok, somehow I lost a month almost 2. I have not been around here much but I promise I have been in the shop and so has my daughter. This month she has been hard at work in the shop as she got herself orders for a total of 8 pens. She is working on a the 5 for one order now. She also has a possible client that would like to buy pens from her to sell at a local farm stand. This is going to take some skill on both of our parts to get them done before the end of the summer. Besides the pens we did some work in April and constructed a very quick mini-raised bed planter box for her to set up a fairy garden in. She has been coming up with ideas for the garden and making some of them on her own out of craft sticks and her scrap wood bin. I will have to get a picture of the garden soon. She is now helping a neighbor build her garden. Sorry for the lack of pics, I promise I will more next month. Hope you all stay safe in the shop and get to share some of that time with someone. Teaching responsibility is awesome. The fact that there is a clear reward for her efforts is even better. Keep up the good work. Any encouragement to the young for a wood shop adventure is WONDERFUL! Good to see her learning new things. Keeps it interesting. Very nice. !!! I noticed that we have the same white “wallpaper” in our shops. :) I even have the little hook hold-downs. Parallel universe. Awesome. My little girl is four now, but I hope this is a glimpse of things to come. As it is she “helps” more than she helps. 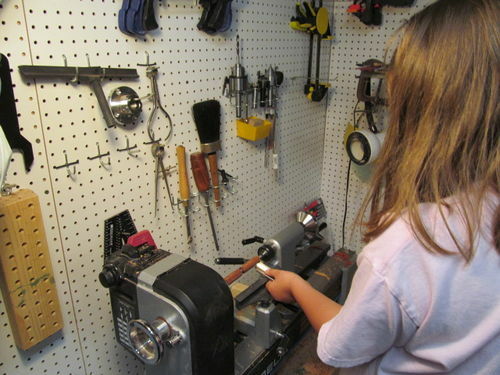 it is wonderful that your daughter is into woodworking and that you are helping learn skills. I wish my one my sons were interested, but they have their own hobbies and they are a lot more creative than me. My grandkids have done some projects in the shop with me, mostly at Christmas time, but they don’t have much time for that now with school, sports, etc. Good for the both of you! She will long remember the time spent in the shop with Dad.